The Chicago Files – Page 919 – A Canadian Perspective on Living in the Windy City! My kind of 4-H Club: Helping Harbors Healing Happiness!! I love motivating people to see their own amazing potential. Every person possesses something to offer to the world (and themselves); sometimes it just takes a bit of a gentle push in the right direction to see it. As often as I can, I like to surprise people with a special treat or unexpected assistance; this can sometimes result in the recipient seeking an avenue to convey a helping message to another person. Without uttering a word, I love to help others by sending them my love, appreciation, and gratitude. I do this through silent prayer, positive energy, and focused healing thoughts. belspror has nominated me to receive the “Awesome Blossom” and “Lighthouse” Awards. Thank you more than words can convey, belspror; I am deeply grateful to accept these awards. Please check out belspror’s phenomenal site. 2. Inform your nominees of their award nominations. 3. Share three ways that you like to help other people. 4. There is no limit to the number of people that you can nominate. 2. 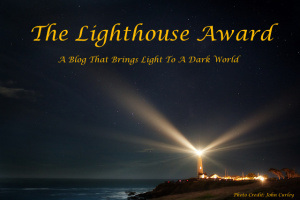 Put the award’s logo on your blog. 3. Nominate 15 Bloggers and tell them by leaving a comment on their blog. I have nominated 18 Bloggers; all will receive both awards. I would like to say that I would love to nominate another person; however, as per her wishes, she would prefer comments on her blog. This is what I am going to do. Thank you again, belspror.